Robert Franks scored 34 points and Washington State ended a 13-game losing streak against Arizona by beating the Wildcats 69-55. TUCSON, Ariz. — Make it an unexpected desert sweep for Robert Franks and the Washington State Cougars. 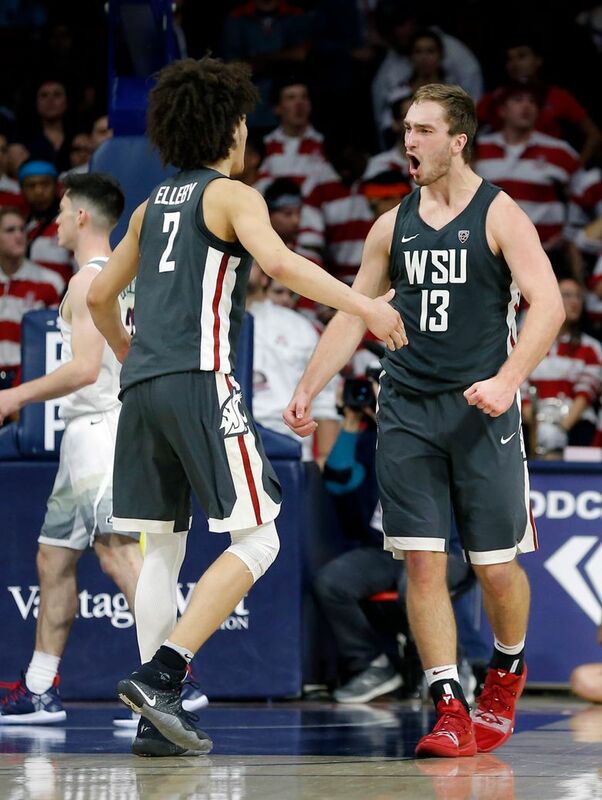 Washington State (10-14, 3-8 Pac-12) won at Arizona State on Thursday, sweeping the Arizona schools on the road for the first time since the 2006-07 season and won in Tucson for the first time since Jan. 8, 2010. C.J. Elleby added 17 points for the Cougars. Justin Coleman led four Arizona players in double figures with 14 but shot just 5 of 14. The Wildcats shot just 32 percent from the field. Franks, who also scored 34 in Washington State’s 91-70 victory at Arizona State on Thursday night, made 12 of 19 field goals, including a season high 8 of 10 threes. 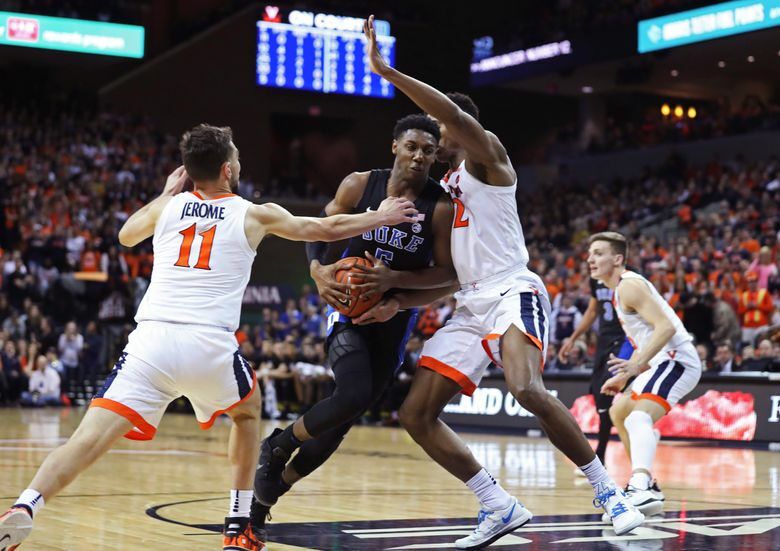 CHARLOTTESVILLE, Va. — RJ Barrett scored 26 points, Zion Williamson had 18 and No. 2 Duke used an early barrage of three-pointers to stun No. 3 Virginia and then held off the Cavaliers 81-71. Barrett hit his first five tries from three-point range for the Blue Devils (21-2, 9-1 Atlantic Coast Conference). His fifth one gave them a 29-15 lead after less than 12 minutes. Cam Reddish took over after that, hitting 5 of his first 6, the last three early in the second half as the Blue Devils rebuilt their lead to 52-41. He finished with 17 points. Parker Van Dyke hit a three-pointer at the buzzer, completing a 22-point comeback and lifting Utah over UCLA. Timmy Allen scored 18 of his 22 points in the second half to lead the Utes (13-10, 7-4 Pac-12). Sedrick Barefield added 19 points and Riley Battin had 18. Van Dyke made five three-pointers in the second half for 15 points. Jaylen Hands scored a career-high 27 points for the Bruins, who dropped their third in a row for the second time under interim Murry Bartow. The Bruins (12-12, 5-6) led by 22 with 12:10 left only to get outscored 48-25 the rest of the way, 23-9 in the last 2:45. McKinley Wright scored 20 points, including two key drives in the closing minutes, and added eight rebounds to lead Colorado over USC. Colorado (14-9, 5-6 Pac-12) won its third consecutive game, while USC (13-11, 6-5) dropped its second straight and third in its past four games. Forward Bennie Boatwright led the Trojans with 24 points. Shaqquan Aaron added 13 points and was the only other Trojan to finish in double-figures. Ethan Thompson scored 20 points with seven rebounds and six assists as Oregon State beat California. Stephen Thompson Jr. scored 21 with three three-pointers and Tres Tinkle added 19 points and three steals for the Beavers (15-8, 7-4 Pac-12). Justice Sueing and Darius McNeill each scored 16 points and Connor Vanover tied a career-high with 15 points and added four blocks for the Golden Bears (5-18, 0-11), who have lost 12 straight. Grant Williams scored 16 points as Tennessee (22-1, 10-0 SEC) beat Florida to complete a season sweep of the Gators (12-11, 4-6) and extend its school-record winning streak to 18 games. Kenny Williams hit the go-ahead three-pointer with 2:08 left in overtime to help North Carolina (19-4, 9-1 ACC) hold off Miami (10-13, 2-9). Markus Howard scored 38 points and Marquette (20-4, 9-2) hung on at the buzzer, edging Villanova and handing the Wildcats (19-5, 10-1) their first Big East Conference loss.